It doesn't take much of anything-time, money, or stress. And it doesn't leave your taste buds in the lurch. No wonder it's catching on. *A whole new take on $3 Meals-250+ cost-busting, slow-cooking, simple, healthy recipes for great meals and more Food prices have done some impressive skyrocketing of late-and predictions are they will continue to do so for some time to come. While the fortunate f… ew can breeze through the checkout lane without fretting over their bank balances, for the rest of us, sticker shock sets in when least expected-and frequently at that. But how to feed ourselves and our hungry families economically and healthfully at that? Following up on her $3 Meals: Feed Your Family Delicious, Healthy Meals for Less than the Cost of a Gallon of Milk (Lyons, April 2009), Ellen Brown here dishes up the answer in delicious terms with more simple, easy-to-follow, family-pleasing recipes. 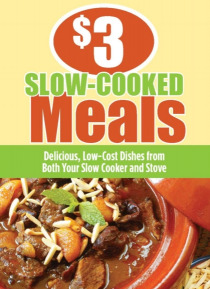 $3 Meals Slow-Cooked Minutes presents 250-plus recipes suited specifically for those who savor the thought of tending to other business, like going to work (or looking for work), while supper simmers in the slow cooker. Main courses are priced so that the cost of a WHOLE meal-including side dishes and a dessert-costs less than $3 per person. The book also includes a treasure trove of valuable tips on how to save money while shopping.